Artists have chops to maintain. In this, we're like musicians or athletes. Subjects as demanding as the human figure or drapery need to be practiced. The eye needs to be kept sharp, or we start getting lazy. We're like athletes. Excepting, of course, that we can get fat, even while practicing. Do not look for justice here, compadre. There is none. 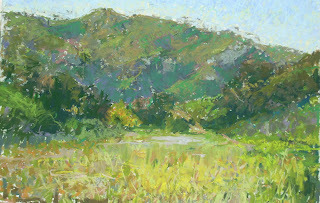 Two weekends ago, on a fine Saturday, a group of my friends went out and painted. Not all the work come in yet, so check back periodically. I'll post everyone's work as I get the jpegs. 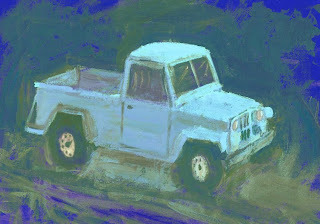 Here's mine, a pastel done from the "equestrian lot" in Laguna Canyon. This isn't a one-time thing. It'll be a monthly excursion for me and as many folks as want to tag along. I'll announce the date and locales in advance, on this blog. Feel free to join us; we bums of the brush and pen aren't snooty. Once a month, generally on the third weekend of the month, with targets ranging from Los Angeles to San Diego County. More to come. 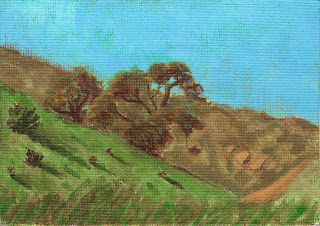 I had forgotten how much I love plein air.